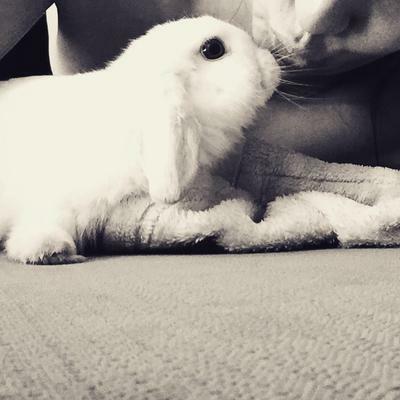 I have got a miniature lop, she is 4 months old and I have had her since she was 6 weeks. She has always be a friendly excited little thing and loves company, however a few things I have noticed. I tend to massage her of a night, very gently, all over, paws, bum, head, back and tummy and she lays flat? As if scared? As if she is weighing down all of her weight so she can't be picked up? I only use one hand to my role her, so she is free to love and leave of she pleases. And when I got to rub her tummy or thigh she pushes onto my hand, as if she likes it? Does my bunny like this or is she scared? Also while playing together or just simply paying her attention, once I stop or I'm just watching her she will nip me on my clothing, never on my skin? Is she mad at me?